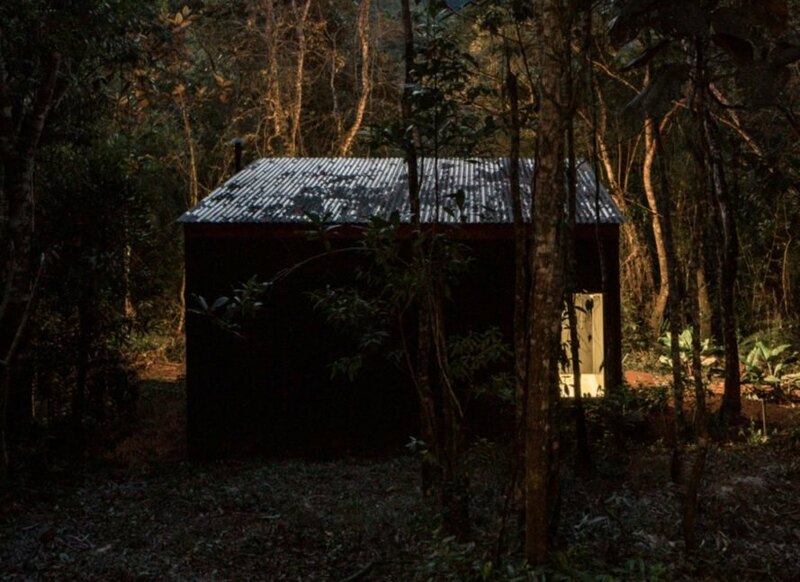 São Paulo-based architect Silvia Acar Arquitetura has unveiled a minimalist tiny cabin tucked into a remote Brazilian forest. Elevated off the ground to reduce environmental impact, Chalet M is one-room cabin with a large glazed facade that connects its humble interior to it stunning surroundings. Located in the heavily forested region of São Lourenço da Serra, the incredible natural setting was the primary inspiration for the design. 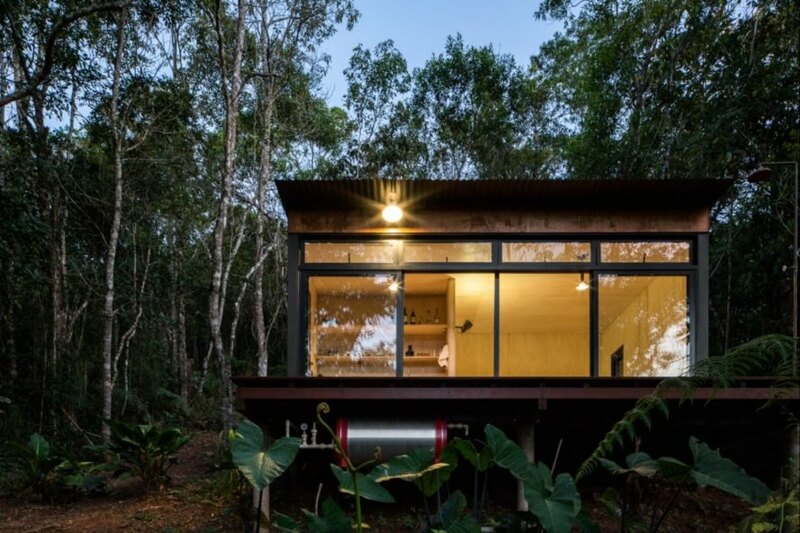 Wanting to create a refuge that would respectfully blend into the surroundings, the architect decided to create a minimal structure comprised of mainly wood, corrugated metal and glass. Although the setting is certainly idyllic, the remote location and rugged landscape provided quite a few challenges for construction. In this area, there is no room for large trucks to pass through. This meant that all building materials had to be lightweight and durable enough to be carried by hand. Accordingly, the entire construction process took place completely on site. 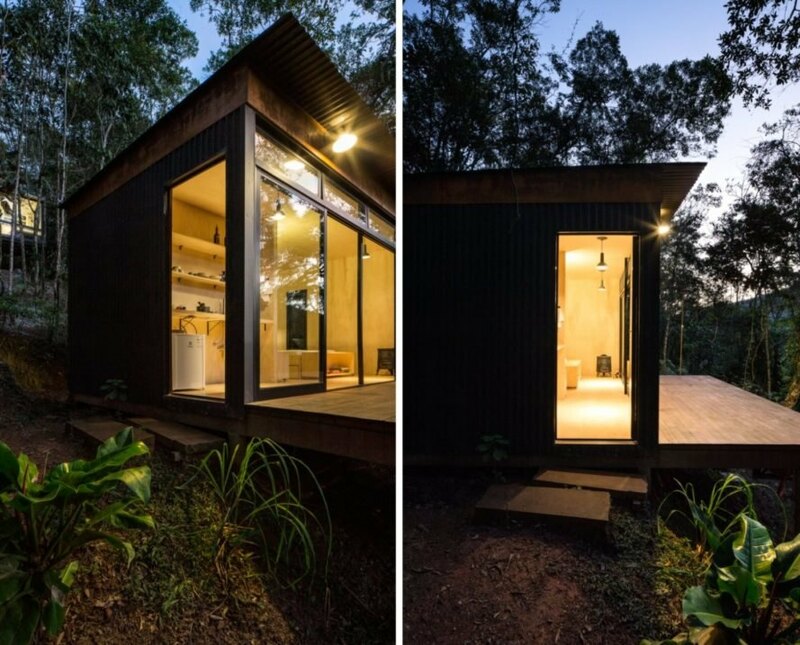 Lightly elevated off the ground to reduce its impact on the environment, the tiny cabin is comprised of various thin sections of hardwood and panels of corrugated metal. The dark exterior is virtually camouflaged into the lush forestscape. At the heart of the refuge is the front facade, which is made up of sliding glass panels that open up to a wooden platform, the best place to take in the views of the mountains across the valley. 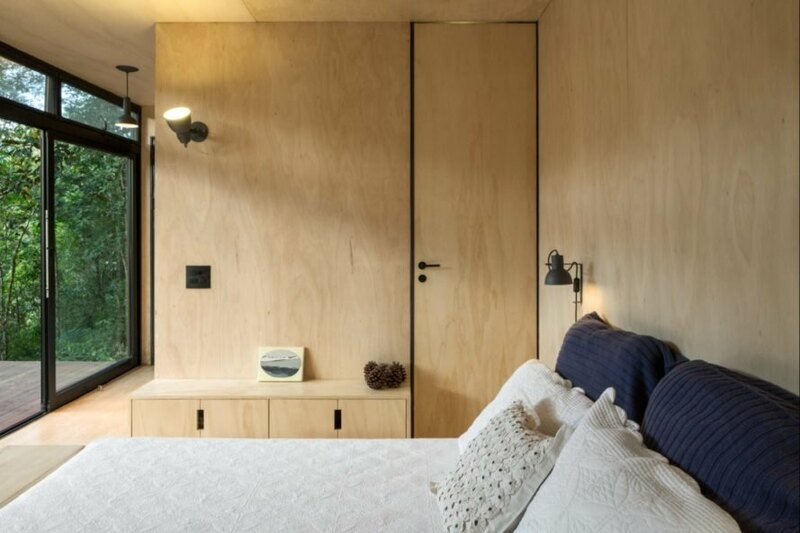 On the interior, the walls are clad in a soothing plywood with thermoacoustic insulation. The simple furnishings, which include a small bed and custom cabinetry, were made out of the same plywood for a cohesive, minimalist finish. 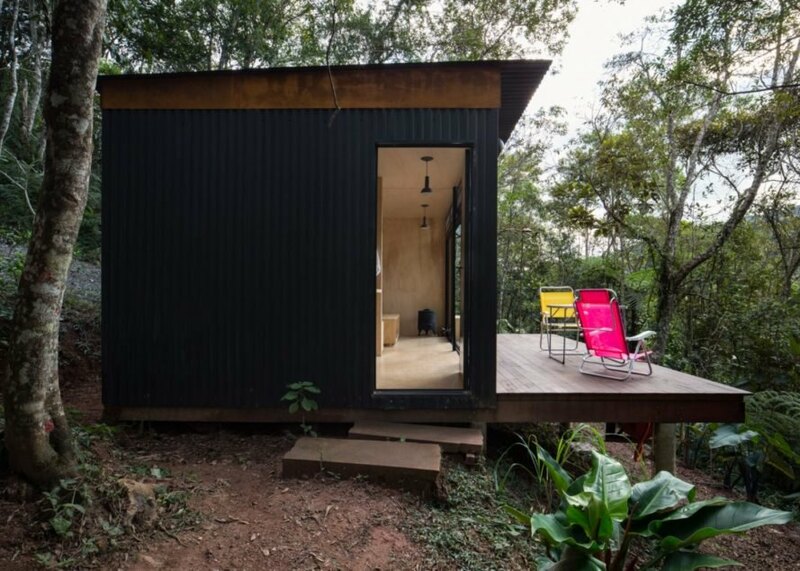 São Paulo-based architect Silvia Acar Arquitetura has unveiled a tiny minimalist cabin tucked into a lush Brazilian forest just outside of São Paulo. 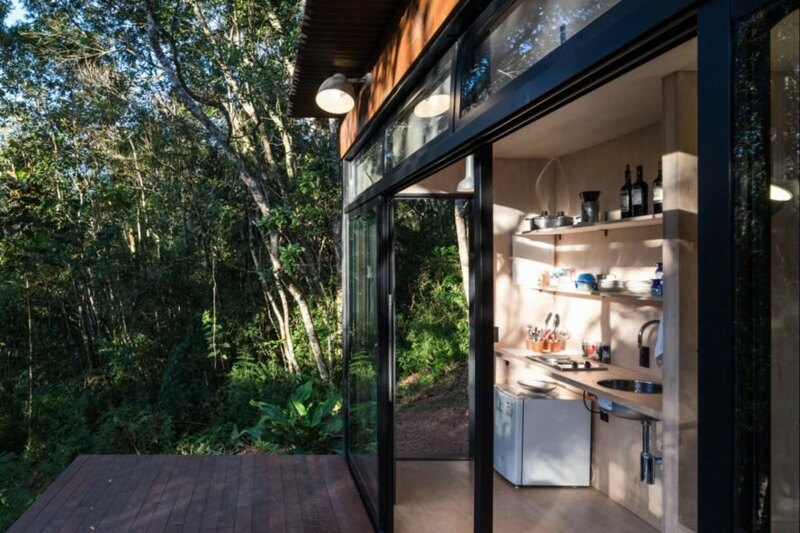 The tiny cabin was elevated off the ground to reduce impact on the environment. A tiny door leads to the one-room interior. The sliding glass doors open to connect the interior with the exterior. The home's design was inspired by the surrounding nature. The interior is clad in natural plywood. 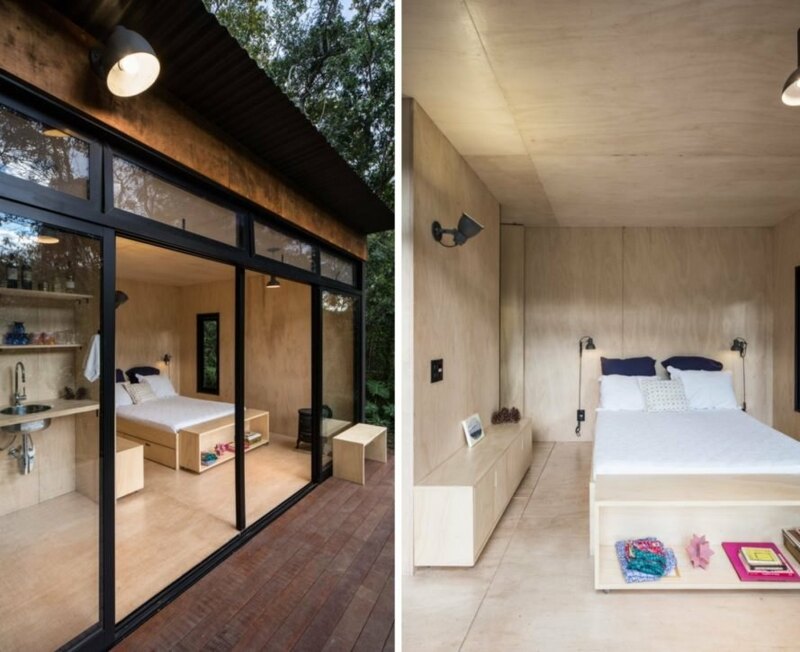 The tiny cabin is meant to be a minimalist retreat. Corrugated metal sheets and wood accents were used on the exterior. The tiny structure is virtually camouflaged into the forest.